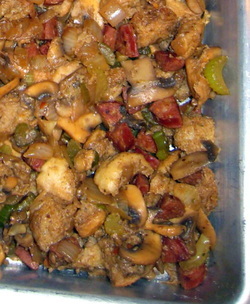 For Thanksgiving, we usually have portuguese sausage stuffing and cornbread stuffing. Portuguese sausage gives stuffing a little more kick traditional pork sausage stuffing. I love a crunchier stuffing so I make gobs of it and bake it pans, rather than actually stuffing it in the turkey. On the few occasions when I'm actually thinking ahead, I freeze the end pieces of loaves of bread for stuffing. Otherwise, I just use what I have and toast the bread. If necessary, toast bread and cube. Slice all vegetables. Slice sausage into 1/2" thick circles, then quarter them. In a dutch oven, cook sausage until well done. The bottom of the pot should have little bits stuck to it. Add a bit of butter to loosen up the bits from the bottom. Add onions, celery and mushrooms in that order. Add a little salt and pepper. If you plan to use chicken broth instead of water, go very lightly on the salt. Start by adding 1T of poultry seasoning, then a little less thyme and marjoram. Toss the bread in, and add water or chicken broth--just enough to get things to stick together, but go slowly because you don't want it to go mushy. Transfer to a baking dish. Bake at 350 degrees until the top is just crunchy.